Etsy and Shopify have proved to be decent eCommerce solutions in terms of functionality and usability. The services make it possible to create online stores, but they utilize quite different approaches to the realization of this task. What are the features that distinguish them from each other? 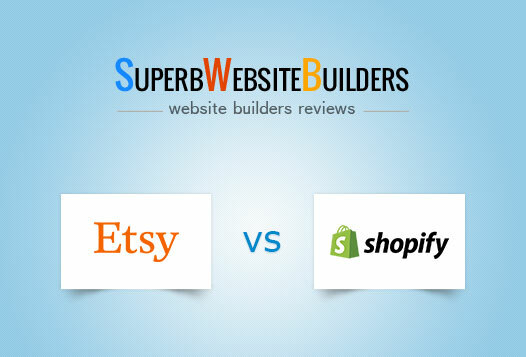 It’s high time to review Shopify vs Etsy now to help you pick the one, which will come up to your web building needs most of all. Etsy – is the global marketplace, which was created with the needs and requirements of crafters in mind. It allows selling unique handmade items and makes it possible to build online stores to grow customer base. The service currently has over 323 millions buyers around the world, who intend to get unique DIY products at reasonable cost. Shopify is the eCommerce software, which has gained worldwide popularity due to the rich feature set, abundance of web design options, quality eCommerce templates and niche-specific tools. The company deals with renowned clients like Wikipedia, Tesla Motors, Google, Mozilla etc. It lets you build small-to-large online stores to showcase and sell different types of digital and physical products. Both services are worth the attention of users willing to bring their businesses online, increase the amount of customers and generate profit. But which of them will be the leader in this comparison? Which eCommerce solution may ensure the utmost functionality to cater to various web building needs? Let’s analyze the services and their features right away to help you make the unbiased decision. Etsy. 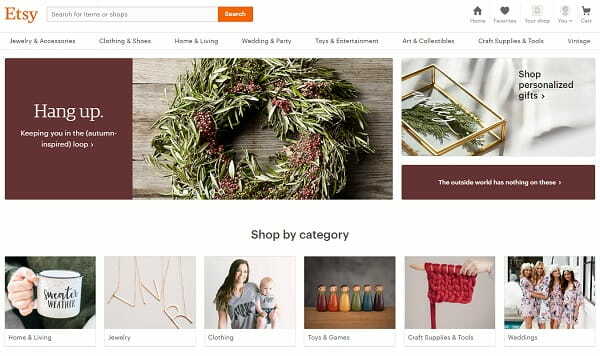 Whether you are a newbie making the first try to set up a web store or a proficient user aware of web design nuances, building an eCommerce website with Etsy won’t trigger any problems. What you need is to provide your personal data, fill out the fields containing your web store info, specify language and location parameters, adjust SEO characteristics, payment and shipping info and start customizing it. 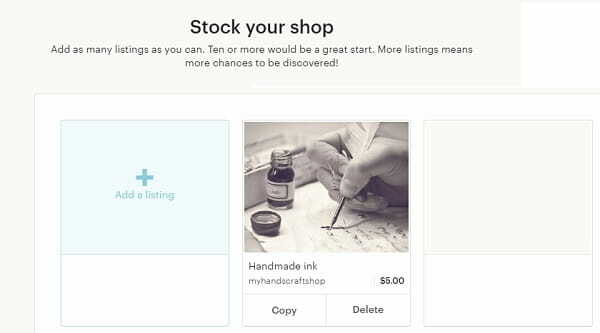 All Etsy stores are structured according to the same principle, which simplifies the task for all user categories. You are allowed to create the unlimited amount of listings, but each of them will be live during 4 months only. If you wish, you can update it afterwards. Make sure to check all the details you submit as each of them has serious impact upon the eventual sales result. If you fail to fill out all the required fields or underestimate the importance of following all the steps the web store creation procedure implies, the final search engine results may not come up to your initial expectations. Shopify. This is the simplest and the most convenient to use eCommerce software. Regardless of the rich number of useful functions, tools and features, the platform creates pleasant impression from the very first moment you start using it. Shopify dashboard comes with a dashboard that creates light and intuitively understandable impression. It’s so user-friendly that you just can’t get lost here. Just follow the steps the wizard offers to create and customize a decent web store with the system. The service works well for everyone, who has the desire to sell digital and physical products, irrespective of the business specialization and expertise level. It’s possible to manage and update your Shopify web store on the go by using the devices you have at hand. Due to the availability of free Shopify apps for Android and iOS, this is easy and quick. Etsy vs Shopify. Launching a web store with both systems won’t be difficult at all. However, Shopify excels at the ease of use, providing greater flexibility and deeper customization options. 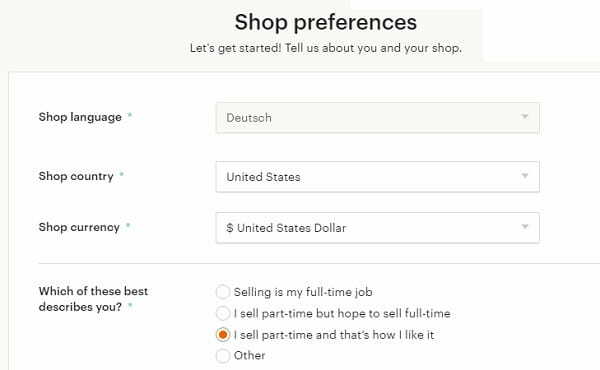 Shopify has a logically-structured control panel, while the amount of settings almost has no influence upon the complexity of mastering the system. Etsy. The service is not similar to popular eCommerce website builders. It comes with specific marketplace parameters and trading rules that are centered around the major specification of the platform – selling handmade products. You won’t be able to sell any other physical or digital products here – keep that in mind. Thus, the functionality of the system goes down to this very objective. The interface of the system is subdivided into 2 parts, namely the user account and online store backend. Web store connection becomes possible after the submission of personal information and payment details. The service allows adding products to be sold within a single trading platform. This scheme can be compared to a huge trading center, which encompasses a large number of stores at a time. All of them are united by the only etsy-dot-com domain. The dashboard contains settings for listings (this is the way trading positions are called here), conversations, orders, statistics preview and marketing. Shopify. The eCommerce software excels at functionality, offering a broad range of features to cover versatile marketing and shopping needs of users. It provides powerful synchronization options (you can synchronize your Shopify account with third-party apps like Xero or Quickbooks), Amazon marketplace integration, blogging engine, product review options, live view feature to keep track of your web store performance in the real-time mode, shopcode integration, the advanced Augmented Reality feature, CSV file import/export, abandoned checkout recovery, multilingual and multichannel support (Shopify has partnership relations with Facebook, eBay, Instagram etc.). You can connect the SSL Certificate and make use of the Fraud Protect feature to ensure the safety of website transactions and customers’ info. Shopify also boasts extended marketing options. Thus, it offers the POS (Point-of-Sale) software, Shopify Ping mobile application, Buy One, Get One (BOGO) discounts, UPS Shopify Shipping feature, one-step dynamic checkout procedure, Shopify App Store with multiple niche-focused widgets and extensions, extensive retail options, advanced Tap and Chip Reader to let customers make quick “tap” payments via Google Play and Apple Pay apps etc. Etsy vs Shopify. When it comes to functionality, Shopify does not have any rivals at all. Etsy feature set encomasses around 20% of options provided by Shopify, which is explained by the narrow specialization of the platform. Shopify is a much more serious eCommerce software, the functionality of which is enough to realize the potential of web stores of different niches and sizes. By making use of the advanced eCommerce and marketing features Shopify offers, you will gain full control over your project. Etsy. The platform cannot boast impressive design options. All websites created with it have almost the same look and don’t differ from each other a lot. The system also lacks design customization options – the only things you can change here are backgrounds, business logo, color palette, layout etc. Etsy doesn’t offer any template choice or CSS code editing options. Design customization parameters are quite restricted and mostly go down to changing the major characteristics only. You won’t be able to upload your own layout, change the design or adjust any other parameters here. What you can do is stick to the available design customization options that do not leave much space for creativity. As a result, you can launch a standard project, which will differ from other web stores by the About the Shop info, tite, header banner, product photos and descriptions as well as icon. Shopify. 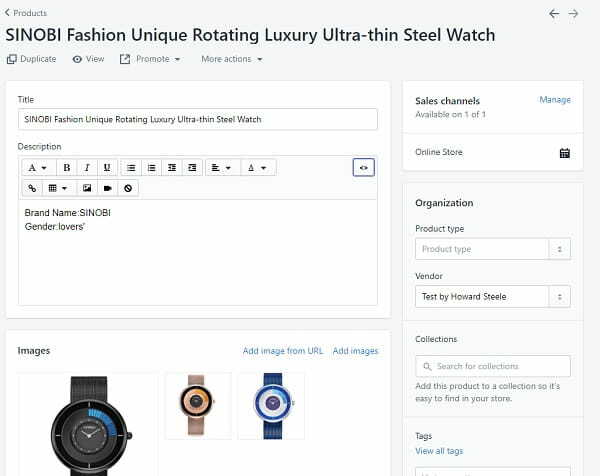 The eCommerce software currently offers paid templates, but it’s also possible to use 10 free themes the system provides. The cost of the paid themes ranges from $140 and up to $180 based on the major design characteristics. All the templates feature high quality and offer extensive design customization options. Paid samples are more versatile, creative and visually-appealing and you can give any of them the required look. It’s possible to edit header, footer and any other blocks your website consists of, set up slideshows, fonts, color schemes and other elements. Template code editing option is available here as well. The system allows changing the theme you’ve selected on any stage of the web design process without losing the submitted content. Thus, Shopify seems to be a very powerful system in terms of quality and design settings. Etsy vs Shopify. Speaking about the design aspect, Shopify is a distinct leader in the comparison. While Etsy doesn’t offer any template selection and rich design customization options, Shopify provides an impressive range of them. There is nothing to compare here – so powerful Shopify design editing options are. Etsy seriously lags behind it in this respect. Etsy. The system grants access to the “Community and Help” section found in the online store dashboard. This is where you can get in touch with the tech support team, read lots of articles and come across general and seller help topics.This is enough to find answers to the most frequent questions users might have. If there are still any questions or doubts left, you can reach the community forum section to have your problems solved here. The search filter option will cut down the overall search time. Shopify. Customer support options Shopify offers are definitely worth the subscription cost. Users can browse a huge forum containing thousands of topics to handle all their issues and read the feedbacks of other users. There are also lots of how-to-guides, helpful articles, recommendations and tips here. Shopify is also proud of its Live Chat feature with a Shopify Guru. Email support is available here as well. What’s more, the platform has its own YouTube channel, where one can come across multiple educative videos. Shopify vs Etsy. Etsy notably lags behind Shopify in terms of customer support, even though, both services offer decent tech support level. Shopify provides a larger amount of educative materials (text and video), YouTube channel, large community forum as well as a live chat. Etsy. The price formation approach the system offers is based on different factors as compared to Shopify. You won’t come across any plans, trials and subscriptions here. The cost of publishing 1 listing constitutes $0.20, the payment is valid for 4 months. The number of products (listings) you can add is unlimited. What’s more, Etsy charges fixed 3.5% commission from the cost of each sold product. The commission, however, does not cover the cost of delivery. Commission fees for sold products have to be manually paid on the first day of each month. You will get the notification and the bill you should pay until the 15th day of the month. Otherwise, your online store may be closed. In other words, the money won’t be automatically deducted from your accounts. All the transactions required to prolong the listings and pay the commissions will have to be completed manually. Shopify. The system offers a 14-day free trial, after which a user has to choose one of the 4 paid plans. The cost of the paid subscriptions starts with $9/mo for the cheapest subscription and goes up to $299/mo for the most expensive plan. The difference between the plans is in the set of marketing tools, advanced sales reports and transaction fee amount. The service offers an opportunity to get money refund during 14 days after the bill is paid. Shopify charges commission fees that constitute from 0.5% and up to 2% depending upon the chosen plan (the more advanced the plan is, the lower the commission fee proves to be, down to 0). Etsy vs Shopify. Overlooking the functionality aspect, we can conclude that it’s more affordable to create an online store with Shopify. Apart from the free trial, the system offers four plans that come at fixed cost and it also charges commission fees you can calculate in advance. The cost of using Etsy will depend upon the number of listings you will upload. The larger your web store is, the higher the price will be. There is the commission fee charged for each product sold, which also contributes to the eventual price. Shopify and Esty are two decent eCommerce website builders, each of which differs in its web design approaches, target audience, functionality and price formation factors. While Etsy is mainly focused on the development of web stores of handmade products, Shopify provides more extensive web design options, making it possible to design small web stores and even hypermarkets. Having compared both services, we can recommend Shopify as the best eCommerce web building solution. Etsy is a worldwide marketplace of unique handmade products that allows building a standard web store with lots of product listings offered for sale. However, it’s quite hard to get to the top of the search engine rankings because of the tough competition here. Shopify is the world-known eCommerce software, the use of which lets you create small-to-large online stores. The system offers a powerful feature set, abundance of design customization tools and reasonable pricing policy to make your web building endeavours a success. Generally, Etsy cannot offer sellers serious perspectives, irrespective of its semblable democracy and visual attractiveness for a customer. This variant may work well for newbies or for those users, who have already distinguished themselves in terms of the platform. Obviously, it is more reasonable to promote an online store created with Shopify, whatever it is. This is a serious business and the right approach. Etsy is a pleasant platform for amateurs. Our choice is Shopify.